The MIT (Marine and Industrial Transmissions Ltd) Group design, supply and service transmissions and driveline systems across the UK. With bases in both southern and northern England, the company provides customers with full product life cycle support for driveline systems both on land or at sea. Whether it be system design, supply, commissioning, maintenance, repair, spares or replacement, the highly trained team of technical engineering experts have built a reputation for delivering exceptional customer service. They have also garnered an ever-increasing product portfolio, enabling them to service applications and equipment that includes concrete crushers, recycling equipment, fishing boats, ferries and much more. 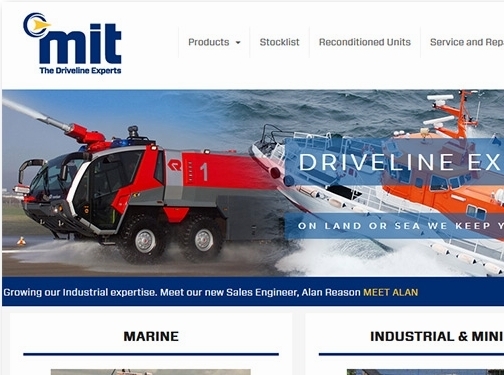 Specialists in repairing and maintaining equipment used across the marine, industrial and mining sectors, the MIT Group also offer bespoke servicing options for industries that use specialist vehicles. From airfield fire trucks in need of pump maintenance, to dump trucks requiring general maintenance, the team works with leading brands such as TwinDisc, Transfluid and Quincy to ensure vehicles are back up and running effectively as soon as possible. Whatever the diagnostic or repair service required, the MIT Group are there to help. Visit their website to find out more about the range of services they offer.